As they talked thus, the sun went down. The cottage was unlit, and in the dim red glow from the burning fire, the two faces—Jubei’s square, the wayfarer’s pointed—floated indistinctly amid the swirling smoke. “By the bye, I suppose you like a drink now and then?” asked the wayfarer with a smile. He had just thought to himself that the man was just an ordinary wayfarer after all, when the wayfarer said, “Continuing on my way through the mountains at this time of night will be terribly difficult, so how about it? I don’t suppose you’d let me stay here tonight, would you? “I’m terribly sorry, but . . .” he said regretfully. “That must have been it,” Jubei gulped meaningfully. “It sent a shiver down my back too, I’ll have you know. I didn’t see anything at all, though. And neither did Yashichi, apparently. But my son was shaking with fear, and the dog was barking like crazy. There must have been something strange. Another Japanese story about a possibly supernatural event—the appearance of a "faceless ghost." Also translated by Ginny Tapley Takemori, this Japanese story describes a widower who grows to better understand his wife after her death. Set more than a hundred years ago, this story-within-a-story describes a mysterious traveler's visit to an isolated mountain cabin. A major Japanese route, connecting Edo (now called Tokyo) to Kyoto. 1/100 of a yen; the hotel cost less than a penny in today's dollars. A place where travelers can rest. Post stations were developed in Japan in the 17th century, though by the Meiji period, fewer people were using post stations, preferring to travel by train. The second-largest volcano in Japan, and a centuries-old religious destination. A kind of seaweed wrapping common in Japanese cuisine. First published in English in Words without Borders' December 2010 issue: Horrors. 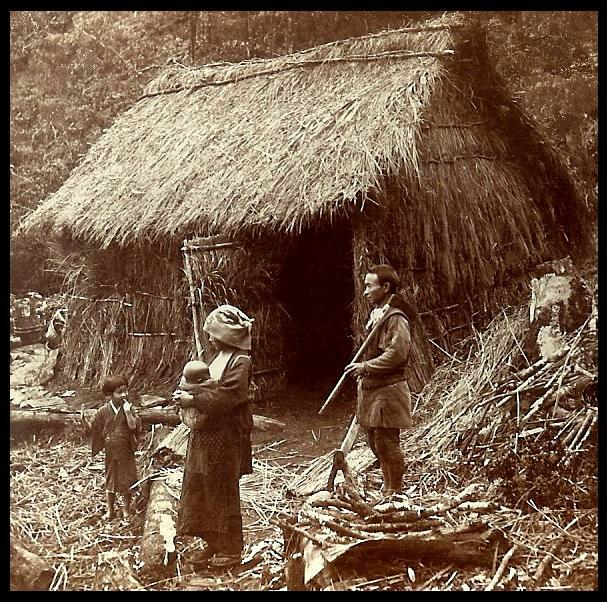 Look at nineteenth-century photographs of a Japanese mountain cottage and a woodcutter. Look at Meiji-era images of places in the story: a painting of Mount Myogi; a painting of a road to Myogi; a photo of a waterfall along the Nakasendo path; and a hand-colored print of a train station along the Usui Pass, from the Museum of Fine Arts Boston. See the sights and learn the history of the Nakasendo Way by taking a virtual tour. Learn about the changes in fashion during the Meiji period in Japan, and find out why there were some people in kimonos, and others who dressed in a “Western" style. Then, look at this 1890 painting of Japanese legislators wearing both kimonos and Western-style clothing. The painting was created in anticipation of the first meeting of the Imperial Diet after the Meiji Constitution was adopted in 1889. To learn more about Japan’s past, read through this timeline of Japan's Modern History from Columbia University’s Asia for Educators initiative. Read the Public Books article “What Global English Means for World Literature.” The article (especially the second half) explains how the Japanese language which was used in this story differs from later Japanese. Okamoto Kido cited Sir Arthur Conan Doyle's Sherlock Holmes stories as an influence; you can read a short story, the novel The Hound of the Baskervilles, and much more on Sherlockian.Net. Watch Akira Kurosawa’s film Rashomon (trailer below), which tells the story of a murder from several different and contradictory perspectives. The film's central dilemma revolves around the question "Whose story should we believe?" Then, read more about this style, known as the "Rashomon Effect." Look at a picture of fall leaves in Karuizawa from tripadvisor. For more photos, look at Autumn Leaves Viewing in Karuizawa from the Nagano tourism site, and the Instagram archive for Karuizawa. Find out the religious significance of Mount Ontake and learn what happened there in 2014. 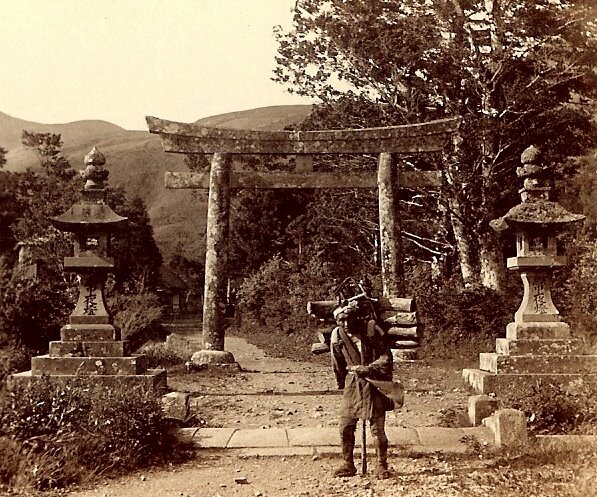 Look through photographs of nineteenth-century Japan. Did this story make you hungry? Read about sushi in the Edo and Meiji eras. In the story, the woodcutter says that some people think that “them things” in the mountains may be monkey spirits. Read a page about monkey lore in Japan. Watch the video Kaidan Suite, which recreates the Edo-era ritual of telling ghost stories by candlelight. Read an article about the recent phenomenon of Japanese millennials turning to Japan’s ancient spiritual heritage, which includes tours of shrines along this way. Look through photos from along the Nakasendo route in a travel column from City A.M. To see more photos, see this travel blog post about the area. Look at an old picture of Karuizawa Station, taken a few decades after the period in which the story is set. For more work from author Okamoto Kido, read The Curious Casebook of Inspector Hanshichi, his best-known book, which is said to have brought the historical detective genre to Japan. Learn about Okamoto Kido’s staging of a new kind of kabuki drama, shin kabuki, read about one of his most famous plays, “Ghosts of Okiku,” and look at old photos of a Kido play produced in Russia. To learn more about kabuki, read through the kabuki page from the Japan Arts Council, or watch this video from UNESCO. Read an interview with Ginny Tapley Takemori, and then read the first chapter of a children’s book she translated: Secret of the Blue Glass, published in The Guardian. Look through a gallery of Meiji-era kimonos from Boston’s Museum of Fine Arts. Read “No Ghosts Need Apply,” a short commentary on the attitude towards ghosts and the supernatural in Sherlock Holmes stories. In "The Kiso Wayfarer," the child's behavior is compared to that of a shore crab and several other creatures. For inspiration to create your own animal analogies, browse through clips from National Geographic and BBC Earth. In "The Kiso Wayfarer," them things sound more and more frightening every time someone mentions them. For another example of fear-inducing repetition, read “The Lottery,” by Shirley Jackson. H.P. Lovecraft wrote, “…the oldest and strongest kind of fear is fear of the unknown.” For more on this topic, read Part I of his essay, “Supernatural Horror in Literature." 3. Fear of the Unknown and "Them Things"